I do not come from a long line of kitchen loving people. Both my mother and my Grandma Mamie worked full time when their children were growing up, so leisurely family meals were not always in the plan. My love of cooking came about from simply being curious about food, wanting to make more at home and wanting my family to have the family meals I was not able to. After my grandma passed away, I was pleasantly surprised to find that she had a small stash of recipes she used for everyday cooking and special events that she had passed on to my mom. Looking through the recipes I saw some that had made an appearance at our meals more times than I could remember. Recipes for fudge, Watergate salad, and pineapple upside down cake are just a few I remember growing up and still see at our family gatherings to this day. 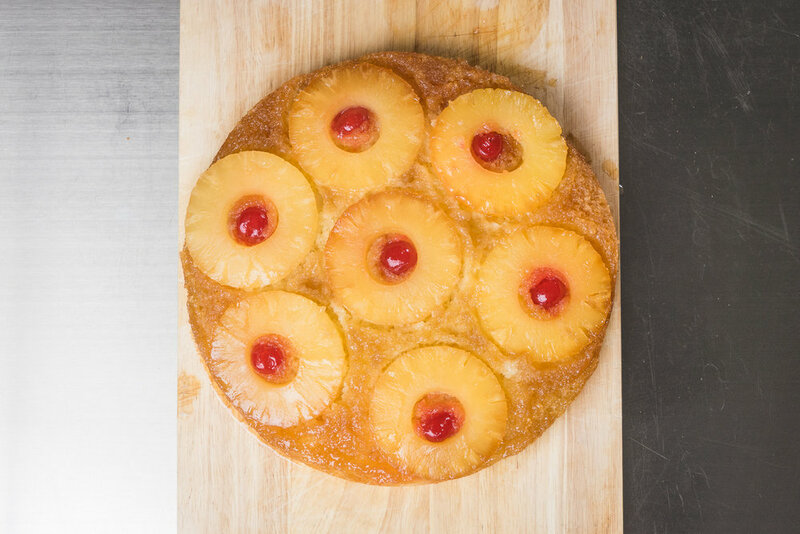 My personal favorite of the family recipes would have to be the pineapple upside down cake. From the tasty cake to the brown sugar sweetened pineapple rings, I just loved everything about it. We all still miss her every day, but a great way to honor and remember someone you love for me is to create something they would love that you can share with others. So in honor of my Grandma Mamie I present you her spin on the classic Pineapple Upside Down Cake. Give it a try and share it with people you love, just like Mamie did. Allow cake to cool for 30-40 minutes before serving. There are as many ways to invert the cake from the pan as there are snowflakes, so do whatever method feels the most comfortable to you and will result in a yummy upside down cake on your plate and no burns on your arms! Some will place a plate over the pan before inverting and some will let it plop to the surface. Whatever gets the cake out is good with me! If you can find it, vegetable shortening in sticks (like butter) make baking with it so much easier! I found this out years ago and always keep a stick or two on hand for baking. This cake is just amazing on it’s own but add a dollop of my Fresh Whipped Cream and it is heaven on a plate! 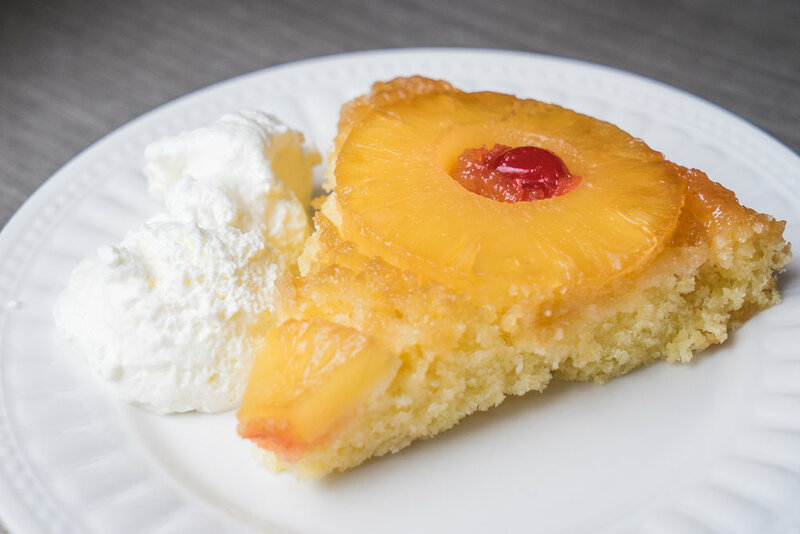 I prefer my pineapple updside down cake topped with cherries, but my grandma (and mom) were not fans so Mamie’s original recipe did not call for them. Do what makes you happy in that regard. I add cherries to the cakes I make and I’m pretty sure my grandma would approve. She’s probably really happy we are all still enjoying her fine cake, even if we add cherries on top.